Watercolor, Oil Painting, Colored Pencil, and Drawing are all classes available for adult and high school students. In the warm, positive environment of our classes you’ll experience the joy of visual expression. 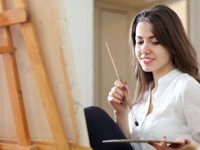 Don’t wait, make a class at the Petersen Art Center part of your life!